The use of standard operating procedures by you as a leader will provide several benefits. First, your intent will be communicated to all individuals on the crew or within the unit. Second, SOPs provide consistency in the way you provide guidance as a leader. Third, SOPs provide subordinate employees with the desired end state and allow them to use their discretion if decisions need to be made. SOPs provide leaders the framework to conduct business safely by allowing them to focus on critical decisions instead of routine ones thus enhancing their decision making ability in stressful situations. Finally, SOPs provide a mechanism to identify needed changes, implement agency policy, enhance training, describe desired performance, and evaluate operational performance. The result is improved operational efficiency, greater accountability, and increased safety. SOPs are not meant to limit the ability of on-scene personnel to make decisions. In fact if developed and implemented properly, SOPs will provide the desired end state and allow decision makers a great deal of flexibility in their decision making processes. SOPs also set the standards for basic crew operations. A variety of tasks such as wearing of crew uniform, rules of engagement, use of the Risk Management Process, and communication procedures can be addressed through the development and implementation of SOPs. The primary objective of this SOP guide is to serve as a planning guide and reference for fire management programs, including individual crews and overhead teams, for developing, implementing, and maintaining SOPs in one of two formats. The first is a stand-alone document. You may wish to develop specific standard operating procedures for very specific situations. If multiple stand-alone SOPs are developed an SOP manual should be considered. The second format is a crew or unit operations guide. By creating this document the crew leader, fire management officer, incident management team leader or unit leader, can outline what is expected of each employee in the performance of his or her duties. The operations guide will provide the framework for each member to know what is expected of them and how they are to carry those tasks out. An issue sometimes arises within organizations about whether to use the terminology “standard operating procedures” (SOPs) or “standard operating guidelines” (SOGs). Some experts feel that the term “procedures” implies relatively inflexible task steps or instructions, while “guidelines” implies more discretion in performing the job. Since emergency incidents are unpredictable and flexibility is essential, these experts advise that organizations develop SOGs, so not to limit responder’s abilities to make informed decisions. Other experts believe the opposite is true: the term “guidelines” implies too much flexibility and discretion, thus reducing control and increasing the likelihood of mistakes. Nonetheless, in regards to the previous statements, terminology is generally less important than content and implementation of SOPs/SOGs. For convenience, the traditional terminology “standard operating procedures” is used throughout this guide. Regardless of the term used in your guide, it is important to note that judgment and discretion must be used on all incidents. 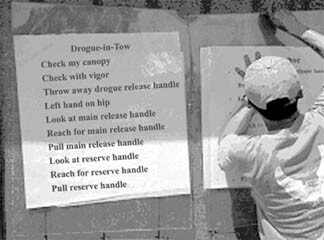 This process is useful in the development of single standard operating procedures or for the development of a crew or unit operations guide. Each item is covered below in greater detail. A task analysis can be summarized as asking yourself basic questions about your unit or crew and making a list of factors that will influence you SOPs. What areas of my operation need SOPs? What situation am I trying to clarify? What process do I want my crew to use for a given situation? Is the development of an SOP the answer to these questions or should I resolve these issues in another manner? There are eight basic steps in the formal SOP development process. You may only need to conduct steps four through eight, however. Is the proposed procedure realistic? Can it work on the fireline, in the office, etc.? Can the procedure be readily implemented given the current resources of the unit? Does the procedure comply with agency policy and guidelines? How will this procedure impact individual crewmembers? Will the procedure survive outside scrutiny? A standardized format for SOPs helps streamline the writing process. Additional benefits include ease of revision or updating and enhanced usability. Regardless of the format, several items are usually included in any single SOP. Samples of the single SOP format can be found below. Single SOPs should be incorporated into a comprehensive SOP manual or as an appendix to a crew operations plan. Numbering system – Important for reference, usability, and integrating SOPs into an overall manual. Effective date – Date the SOP is officially adopted for use in the field. This may be different from the date of issue. Expiration/review date – Important for ensuring the currency of SOPs by establishing a date for periodic review and revision, if needed. Title – Name given to the procedure. Description of purpose or rationale statement – Describes the purpose of the SOP, why it is needed, and what it intends to accomplish. Authority signature(s) – Indicates that the SOP was properly created, reviewed, and approved by the crew leader, FMO, or line officer. Scope – Describes situations for which the SOP was created and the intended audience. General procedures – The body of the SOP; sets forth broad procedural guidelines for operations. Specific procedures – Specific actions necessary under the SOP to safely mitigate a situation. References – Source material used to create the SOP or useful in the future evaluations. Everyone is informed about the new or modified SOP and understands the significance of the change. Copies of the SOP are distributed as needed and readily accessible to all potential users. Personnel know their roles and have the knowledge and skills necessary to implement the SOP safely and effectively (including an understanding of consequences for failing to comply). A mechanism exists to monitor performance, identify potential problems, and provide support in the implementation process. Who needs to be trained in the new or revised SOP? What instructional content should be covered? What training methods will be most effective? Will a simple crew meeting with distribution and discussion of the new SOP be adequate? How will understanding and competence be evaluated? How long will the training sessions take? How will training be scheduled and administered? Keep in mind that training is perhaps the most critical component of the SOP implementation process. Training is the means by which the SOP becomes a useful and intuitive operational tool. Some procedures will not require extensive orientation and are self-defining; others will require more explanations and definition. The best SOP will be ineffective or even dangerous if crew members are not capable of carrying it out. It is up to you to ensure that each crewmember understands the SOP and is capable of carrying it out. What training materials are needed? Who will prepare them? Who can teach this material effectively? What facilities, special equipment, and supplies are needed? What timeframe is appropriate for initial training and refresher training? Can training be integrated with other training or unit activities? What records should be maintained? What reporting requirements are applicable? What were employee behaviors and actions before the SOP was implemented? What administrative or operational problem was the SOP designed to address? Was the new SOP fully implemented, or were there unexpected barriers to full implementation? How did employee behaviors and actions change after introduction of the SOP? Were the changes in behaviors and actions what were intended? Was the purpose of the SOP accomplished? Is the need for the SOP still current? Is the current SOP the best solution? You will find that following the process outlined for the development, implementation, and evaluation of SOPs is helpful in the development of a crew or unit operations guide as well. Start at the beginning by conducting a task analysis and walk through the process, bypassing those steps which do not apply to your situation. It is important to note that an operations guide, like a stand-alone SOP, is only effective as your ability to communicate its purpose, use, and individual accountability in its application. The following is a suggested format for an operations guide along with topical material contained therein. You may find that your crew or unit has specific needs that are not addressed here and should adapt this format as necessary. Cover page with document title, unit/crew name and logo, and date. Ideally the development of a Vision Statement would involve all affected employees. Operational Procedures – These SOPs will obviously vary with the specific job functions performed by the crew/unit. Review the task analysis information found above in the SOP development section to help determine areas in need of Standard Operating Procedures.